KE00016 is a solid phase sandwich Enzyme Linked-Immuno-Sorbent Assay (Sandwich ELISA). 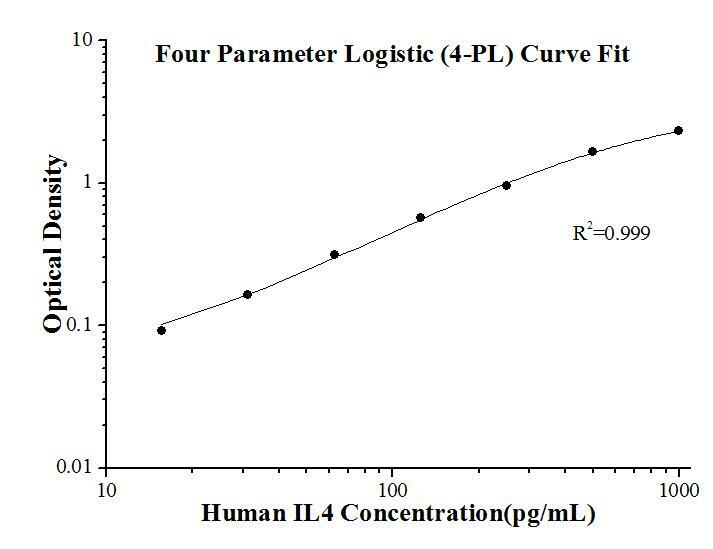 The IL4 ELISA kit is to be used to detect and quantify protein levels of endogenous IL4. The assay recognizes human IL4. A monoclonal antibody specific for IL4 has been pre-coated onto the microwells. The IL4 protein in samples is captured by the coated antibody after incubation. Following extensive washing, a polyclonal antibody of biotinylated specific for IL4 is added to detect the captured IL4 protein. For signal development, Streptavidin-HRP is added, followed by Tetramethyl-benzidine (TMB) reagent. Solution containing sulfuric acid is used to stop color development and the color intensity which is proportional to the quantity of bound protein is measurable at 450nm with the correction wavelength set at 630 nm. Interleukin-4 (IL-4), a member of the α-helical cytokine family, is produced by activated CD4 + T cells, basophils, and mast cells. It promotes the proliferation and differentiation of antigen presenting cells. IL4 also plays a pivotal role in antibody isotype switching and stimulates the production of IgE. This cytokine has been applied in the treatment of autoimmune disorder like multiple myeloma, cancer, psoriasis, and arthritis. IL4 has also been extensively applied to inhibit detrimental effect of Th1. It may promote the growth of epithelial tumors by mediating increased proliferation and survival. Changes in expression of p53 and inflammatory factors in patients with ulcerative colitis.